Will Riyadh Get the Bomb? As the impasse over Tehran's nuclear program worsens, those most likely to be directly effected by an Iranian bomb are showing greater alarm. While the media fixates on Israel and its possible reaction, other regional players have no less at stake. Despite Riyadh's long-held advocacy of making the Middle East a zone free of weapons of mass destruction, there has been much speculation in the last two decades about the possibility of its acquiring or developing nuclear weapons should Tehran obtain the bomb. In the words of King Abdullah: "If Iran developed nuclear weapons … everyone in the region would do the same," a sentiment echoed by Prince Turki al-Faisal, former head of Saudi Arabia's General Intelligence Directorate. Has Riyadh decided to go down the nuclear road, or is this bluster a desperate bid to stop Tehran's nuclear program dead in its tracks? The lack of American will to confront the ayatollahs and stop them in their tracks has given various Arab leaders plenty of incentive, as well as a good excuse, to proceed down the nuclear trail ... If the Iranians aren't stopped, and soon, we may wake up a few years from now to discover that Saudi Arabia and other unfriendly regimes have decided to upgrade their "civilian" nuclear programs into weapons-making industries. Additionally, the Saudis are increasingly nervous about the strength of any U.S. commitment in light of the Obama administration's abandonment of such a long-standing regional ally as Egypt's Hosni Mubarak. There is no intention currently to pursue a unilateral military nuclear programme but the dynamics will change immediately if the Iranians develop their own nuclear capability … Politically, it would be completely unacceptable to have Iran with a nuclear capability and not the kingdom. turning Iran into a hegemonic power over the [Persian Gulf] states of the region, through its control of Iraq, its holding fast to the continued occupation of the UAE's [United Arab Emirates] islands, and its intervention in the domestic affairs of countries in the region through the agitated Shiite groups in these countries, which could push the GCC [Gulf Cooperation Council], namely Saudi Arabia, to seek, in turn, the acquisition of a nuclear weapon to confront Iran. Sanctions are a long-term solution ... But we are looking at an Iranian nuclear program within a shorter term because we are closer to the locus of the threat. We are interested in immediate rather than in gradual solutions. Diplomatic cables obtained by WikiLeaks reveal that King Abdullah privately warned Washington in 2008 that if Iran developed nuclear weapons, Saudi Arabia would do the same. A third factor in the Saudi calculus is Israel's nuclear and ballistic missile capabilities. Given Israel's status as an assumed but undeclared nuclear weapons state, the most immediate consequence of Tehran's crossing the nuclear threshold would be the emergence of an unstable bipolar nuclear competition in the Middle East. Were Israel to end this ambiguity and admit its possession of nuclear weapons, this might provide a form of deterrence against Iran, which in turn will increase the pressure on Riyadh to acquire its own deterrent vis-à-vis both countries. Finally, domestic factors must be taken into account. So far, King Abdullah and even Crown Prince Salman favor the continuation of military cooperation with the United States, but the two suffer from old age and poor health, and a change at the top of the pyramid could have a decisive impact on this issue. However, there has long been speculation that the royal family is divided over the nuclear issue. Former intelligence chief Prince Turki al-Faisal favors a secret nuclear program for military uses in cooperation with Pakistan and is supported in this by Prince Bandar Bin Sultan, director of the Saudi intelligence agency and former ambassador to the United States. In contrast to the hawks in Riyadh, there is also a group, headed by Foreign Minister Saud al-Faisal, which opposes establishing a secret nuclear military program reliant on Pakistan and prefers to be defended against Iran under the U.S. nuclear umbrella. It is in the Kingdom's long-term geopolitical and security interests to maintain its leadership role in the global oil arena. Riyadh's ability to threaten other oil producers that it could flood the oil market is a critical aspect buttressing its leadership role inside OPEC [Organization of the Petroleum Exporting Countries] and gives the country regional clout as well. Saudi Arabia's ability to single-handedly alter the price of oil gives the Kingdom significant geopolitical power, and it has used its ability to lower the price of oil to its geopolitical advantage on many occasions over the decades. With this oil superpower stature comes much of the global influence that Saudi Arabia enjoys on the international stage. But the kingdom is an oil-consumer as well as a producer. Burning oil for electricity production currently consumes about a quarter of the crude oil Saudi Arabia produces, which could have very serious implications for the future. In 2011, Saudi Arabia consumed an average of 2.87 million barrels per day (mb/d). The country needs to find at least another 20 gigawatts (GW) of generating capacity by 2020 to add to its existing 40 GW if it is to meet projected demand. As the GCC's largest economy, Saudi Arabia has more reason than most to turn to nuclear power. 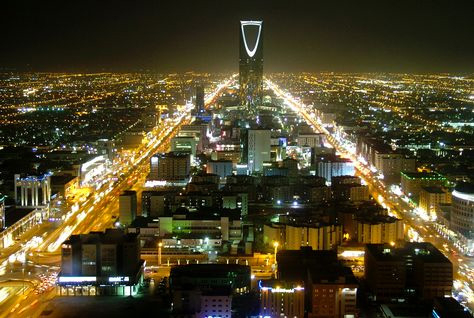 Saudi Arabia's current energy consumption is rising exponentially as illustrated by this image of Riyadh at night, potentially forcing it to cut exports to meet rising domestic demand. The Saudi government recently declared its intention to launch its own nuclear program, one that could, however, be transformed from a strictly civilian project to a military one. According to analysts at Riyadh-based Jadwa Investment, oil demand in the kingdom rose by 22 percent between 2007 and 2010, outpacing China's oil demand growth rate despite the latter's economy expanding almost three times as fast. While official data shows Saudi oil consumption rising by more than 5 percent a year in 2003-10 to an average of 2.4 mb/d in 2010, analysts at British Petroleum put it at 2.85 mb/d in 2011, (see Tables 1 and 2) making Saudi Arabia the world's sixth-largest oil consumer. On a per capita basis, its oil consumption is sky-high; its consumption in 2011 is set to jump by 5.6 percent, way above the global average of 1.4 percent. Some economists argue that if Saudi Arabia's energy consumption continues at its current rate, within twenty years the kingdom will burn the equivalent of almost all its recent daily output—more than 8 mb/d —or around two-thirds its total production capacity. Citigroup goes further to say that Riyadh could be an oil importer by 2030. Oil and its derivatives account for 50 percent of Saudi electricity production, mostly for residential use. According to Citigroup analysis, if nothing changes, the Saudis may have no available oil for export by 2030. The head of Saudi Aramco has admitted that unless internal demand is controlled, the amount of oil left for export could fall to less than 7 mb/d by 2028. Jadwa Investment paints an even bleaker picture, declaring that the kingdom could face a serious revenue crisis within the current decade, forced to cut exports to meet rising demand. By 2020, it expects exports available for the global market to fall to less than 5 mb/d. Source: Adapted from BP Statistical Review of World Energy, (June 2012), pp. 8-9. Given rising spending needs, the International Monetary Fund (IMF) estimated the break-even oil price for Saudi crude in 2011 to be US$80 a barrel, a rise of US$30 a barrel from three years ago; this would increase to US$98 by 2016. The Washington-based Institute of International Finance suggested that Saudi Arabia will need at least US$110 for oil by 2015 to balance its budget. But even these figures look conservative; the sheer scale of the kingdom's spending commitments now necessitates a substantially higher oil price. First, we need to secure international cooperation; second, come up with long-term planning; third, study the required safety measures mandated by the international community; fourth, ensure we have the needed fuel supply; and fifth, we must prepare a national work force that is educated in nuclear engineering and operation. Such projects would, however, enable the Saudis to enrich uranium. With the aid of their Sunni allies in Pakistan, they could then obtain knowledge of bomb-making capabilities and the relevant technologies. Saudi nuclear ambitions crystallized in the run-up to the 2009 Copenhagen summit when it was realized that global efforts to control climate change could end up punishing countries that put off including non-carbon-based energy sources in their power portfolios. According to the World Trade Organization, the Saudi economy is increasingly dependent on international trade: The ratio of merchandise and services trade (exports and imports) to gross domestic product (GDP) rose from 88.7 percent in 2005 to a peak of 104.9 percent in 2008 and reached 97.4 percent in 2010. Riyadh's export base is highly concentrated in fuels (petroleum and gas). The share of fuels in total merchandise exports depends largely on the evolution of world oil prices and Riyadh's quota production within OPEC. In value terms, the share of fuels in total merchandise exports (including re-exports) went from 89.5 percent in 2005 to 85.7 percent in 2010. There have been suggestions that, rather than develop an indigenous nuclear program, Saudi Arabia would simply seek to buy nuclear warheads from Pakistan or China. According to a news media report, Riyadh is beefing up its military links with Islamabad to counter Tehran's expansionist plans either by acquiring atomic weapons from Islamabad or a pledge of nuclear cover, a claim also reported earlier in The Guardian. Alternatively, Pakistan might offer a deterrent guarantee by deploying its own nuclear weapons, delivery systems, and troops on Saudi territory. This arrangement could be particularly appealing to both Riyadh and Islamabad, allowing the Saudis to argue that they are not violating the nuclear nonproliferation treaty (NPT) since the weapons would not be theirs. A Pakistani presence might also be preferable to a U.S. one because stationing Muslim forces on Saudi soil would not trigger the kind of opposition that has in the past accompanied the deployment of "infidel" U.S. troops. Despite these rumors, the Pakistanis know as well as anyone that the principal threats to the security and stability of Saudi Arabia are domestic against which nuclear weapons have no value but rather might stir up more trouble than they alleviate. But, a good Pakistani working relationship with Washington is essential. The Enhanced Partnership with Pakistan Act of 2009 (also known as the Kerry-Lugar-Berman bill) authorized a massive increase in U.S. civilian assistance to Islamabad, tripling it to US$1.5 billion a year. In spite of tensions between the two states, Pakistan remains keen on developing its relationship with Washington, and continued proliferation of nuclear technology is unlikely to encourage either economic or military aid. Indeed, selling complete nuclear weapons would come at great political cost. Islamabad might forfeit U.S. foreign assistance and drive Washington into closer cooperation with its mortal enemy India. Providing Riyadh with a Pakistani nuclear umbrella would also increase the likelihood of convergence between New Delhi and Tehran as both nations might view the move as part of a larger Sunni threat. In addition, Saudi nuclear acquisition could prompt a preventive strike by Israel—especially if the sale became known before the weapon was activated. Finally, although relations with Islamabad are improving, the House of Saud has no great trust in Pakistan's intentions; on the contrary, many of the WikiLeaks documents revealed Saudi dissatisfaction with Pakistani politicians and policies. In theory, the Saudis could pursue a nuclear option with the Chinese, but in the current strategic environment, it is hard to imagine this as a realistic scenario. Beijing and Riyadh have never had close military relations largely because Washington has provided the Saudis with advanced military equipment as well as security assurances against international threats that China cannot provide. While Beijing and Washington do not see eye-to-eye on many issues, including the severity of the Iranian threat, it is unlikely that Beijing would jeopardize its trade and other relations with Washington by supplying the Saudis with nuclear weapons. Additionally, China is a member of the NPT system and thus obliged "not in any way to assist, encourage, or induce any nonnuclear weapon State to manufacture or otherwise acquire nuclear weapons or other explosive devices, or control over such weapons or explosive devices." Under the Nuclear Proliferation Prevention Act of 1994, Beijing would face revocation of the U.S. nuclear cooperation agreement it worked so hard to secure, as well as the possible imposition of economic sanctions, if it were deemed to have "aided or abetted" the acquisition of nuclear weapons. If U.S.-Saudi relations should falter, the Chinese would doubtless view it as an opportunity to take a more active role in Saudi affairs. However, there is no evidence suggesting that this relationship will sour in the near future; in fact, as shall be seen, it is clearly improving. Technical barriers for entry into the nuclear club are high, and it is difficult for states to completely hide a clandestine military program from foreign intelligence observers. For example, the West successfully (albeit belatedly) detected Tehran's secret uranium enrichment facility constructed in tunnels under a mountain near Qom. Indeed, many analysts believe that Riyadh's talk about developing nuclear arms may be more intended to focus Western attention on its concerns about regional risks than to indicate any kind of definitive action to go nuclear. It is unlikely that the Saudis would want to proliferate at the present time; doing so would deeply strain the U.S.-Saudi relationship, perhaps to an irrevocable degree. Doing so would also place Riyadh in breach of a memorandum of understanding signed with Washington in 2008, promising U.S. assistance with civilian nuclear power on condition that Riyadh not pursue "sensitive nuclear technologies." Riyadh's desire to maintain a strong relationship with Washington, especially in light of the royal family's desire to prevent unconventional terrorism within its borders, inhibits any strong appetite to develop nuclear weapons. the package of sales would not only tilt the balance of conventional weaponry in the Gulf decisively against Iran, whose suspected bid to acquire atomic bombs frightens its Gulf neighbors as well as Israel and the West. It would signal the return to normal of America's tight, 70-year-long alliance with Saudi Arabia. This had frayed following the revelation that 15 of the 19 hijackers who attacked American cities on September 11, 2001, were Saudi nationals. Fearing congressional opposition, Saudi Arabia had in recent years sought weaponry from other sources. Riyadh will also feel more secure from Tehran's missile capabilities once it acquires the Terminal High Altitude Area Defense (THAAD) system. This system is intended for shooting down short-, medium-, and intermediate range ballistic missiles in their terminal phase, using a "hit-to-kill" approach. At the same time, a potential $30 billion upgrade of the Saudi navy would greatly strengthen the latter's power projection in the Persian Gulf and the Red Sea. Ultimately, the U.S. arms package will increase Riyadh's confidence and capabilities in countering Tehran's rising power in the Middle East. The Saudis' weapons of choice are cash and diplomacy. It is difficult to imagine the princes of the House of Saud deliberately positioning themselves as global outliers and inviting reprisal from countries capable of inflicting serious damage on them. Journalist Richard Nield has noted that Riyadh has committed itself to a major industrialization and economic diversification campaign that will require sustained engagement with the rest of the world. "It's not rational that they would jeopardise this in favour of a preemptive strike against the theoretical possibility of a nuclear-armed Iran." The same idea is echoed by Kate Amlin, who believes that Saudi leaders would not want to incur the political and economic backlash resulting from pursuit of a nuclear arsenal at a time when they are trying to integrate further into the international economy. Finally, it would take many years and considerable financial cost for Riyadh to develop nuclear weapons. There exists a relatively strong consensus regarding the immature state of the Saudi nuclear technology infrastructure. The country lacks the human expertise and technical knowledge necessary to develop a nuclear weapons program on its own. It does not operate nuclear power facilities, and its scientists do not have the necessary experience to enrich uranium for reactor fuel, to convert nuclear fuel, or operate nuclear reactors. A recent Citigroup report warns that several complex issues are likely to result in delays to Saudi Arabia's target nuclear power launch of 2019: the lack of available nuclear power experts; cost overruns or high capital costs, and above all, plant safety risks such as keeping plants cool in desert conditions since there is no history of successful execution in such conditions. According to Citigroup, the "safest location for a nuclear plant in Saudi Arabia is deep in the desert between Riyadh and Jeddah. Water would have to be piped over 30 miles to this region and under conditions that keep the pipes and plants cool." There have, however, been clear signs recently of the Saudis' intent to enter the nuclear arena. In June 2010, the kingdom commissioned Finnish management consultancy Poyry to offer a strategy for nuclear and renewable energy use and to study the economic and technical feasibility of becoming involved in all aspects of the nuclear power chain, including uranium enrichment. Earlier that year, the Saudi government said it planned to build a new technology centre, the King Abdullah City for Nuclear and Renewable Energies, in Riyadh. Despite this, it will be years before it is developed. In a 2007 visit to Saudi Arabia, Mohammed ElBaradei, then-director general of the International Atomic Energy Agency, estimated that the Saudi nuclear civilian plan might take up to fifteen years. Given that it is the world's top oil exporter, handling a nuclear Saudi Arabia would be a delicate manner. But, at least for now, the Saudis have no alternative but to rely on a U.S. defense umbrella. Still, it would be contrary to Riyadh's practice to put all its eggs in one basket. Thus, the kingdom will work in two parallel routes, strengthening its military, particularly the air force and navy, and aggressively seeking to buy the civilian nuclear technology that will in the future provide the technical capacity and human resources for dealing with nuclear weapons. Overall, though not insurmountable, the obstacles to Saudi nuclearization are considerable. Much depends on Tehran's ambitions and the West's determination to stymie them. Naser al-Tamimi is a U.K.-based Middle East analyst with research interest in energy politics and Middle East-Asia relations. He holds a PhD degree in International Relations from Durham University, U.K.
 Robert Shuey and Shirley A. Kan, "Chinese Missile and Nuclear Proliferation: Issues for Congress," U.S. Congressional Research Service, Nov. 16 , 1995; The New York Times, July 10, 1999; The Guardian (London), Sept. 18, 2003; The Washington Times, Oct. 21, 2003; Dan Blumenthal. "Providing Arms: China and the Middle East," Middle East Quarterly, Spring 2005, pp. 11-9; Cicero (Hamburg), Mar. 28, 2006; Ha'aretz (Tel Aviv), May 30, 2012. The Guardian, June 29, 2011. Eric S. Edelman, Andrew F. Krepinevich, Jr., and Evan Braden Montgomery, "The Dangers of a Nuclear Iran," Foreign Affairs, Jan./Feb. 2011, pp. 66-81. Michael Freund, "When Saudi Arabia Goes Nuclear," The Jerusalem Post, Apr. 29, 2010. The Wall Street Journal, June 23, 2011. The Times (London), Feb. 10, 2012. Abdulaziz Sager, "Alwady'a fi al-khaleej: Derasa Isteshrafeya 2025," paper presented to the Manama (Bahrain) Development Forum, Feb. 8-9, 2008, in al-Wasat News (Bahrain), Feb. 13, 2008. "Saudi Arabia Defense and Security Report Q1," Business Monitor International (London), Jan. 2011, p. 55. Thomas W. Lippman, "Nuclear Weapons and Saudi Strategy," Middle East Institute, Policy Brief, no. 5, Jan. 2008. Associated Press, Feb. 15, 2010. The Guardian, June, 29, 2011. "Avoiding a Nuclear Arms Race in the Middle East," Report to the U.S. Senate Committee on Foreign Relations, Washington, D.C., Feb. 2008. Edelman, Krepinevich, and Montgomery, "The Dangers of a Nuclear Iran," pp. 66-81. Kathleen J. McInnis, "Extended Deterrence: The U.S. Credibility Gap in the Middle East," The Washington Quarterly, Summer 2005, pp. 169-86. Jareer Elass and Amy Myers Jaffe, "Iraqi Oil Potential and Implications for Global Oil Markets and OPEC Politics," James A. Baker III Institute for Public Policy, Rice University, July 2011. Mark Hibbs, "Saudi Arabia's Nuclear Ambitions," Carnegie Endowment, Washington, D.C., July 20, 2010. "Oil Market Report," International Energy Agency, Paris, Nov. 13, 2012. Petroleum Economist (London), Dec. 14, 2010. Brad Bourland and Paul Gamble, "Saudi Arabia's Coming Oil and Fiscal Challenge," Jadwa Investment, Riyadh, July 2011. "BP Statistical Review of World Energy Report," British Petroleum, London, June 2012, p. 9. Bourland and Gamble, "Saudi Arabia's coming oil and fiscal challenge." Financial Times (London), Feb. 28 2011. Heidy Rehman, "Saudi Petrochemicals: The End of the Magic Porridge Pot?" Citigroup, London, Sept. 2012, p. 1. "Regional Economic Outlook: Middle East and Central Asia," International Monetary Fund, Washington, D.C., Sept. 2011, p. 22. Elass and Jaffe, "Iraqi Oil Potential." Middle East Economic Digest (MEED, Dubai and London), Dec. 23, 2011. Al-Akhbar (Beirut), Feb. 9, 2012. Saudi Gazette (Riyadh), Feb. 22, 2012. The Daily Mail (London), Feb. 24, 2012. Saurav Jha, "China's 'Third Island' Strategy," World Politics Review, Jan. 6, 2010. "The Kingdom of Saudi Arabia," Trade Policy Review, World Trade Organization, Geneva, Dec. 21, 2011. United Press International, Sept. 15, 2011. The Guardian, May 11, 2010. Edelman, Krepinevich, and Montgomery, "The Dangers of a Nuclear Iran," pp. 90-1. Alexander Evans, "Pakistan and the Shadow of 9/11," RUSI Journal, Aug./Sept. 2011, pp. 64-70. "Saudi Arabia Defense and Security Report Q4," Business Monitor International, Jan. 2012, p. 66. James M. Lindsay and Ray Takeyh, "After Iran Gets the Bomb: Containment and Its Complications," Foreign Affairs, Mar./Apr. 2010, pp. 33-49. See, for example, Associated Press, Dec. 3, 2010. Treaty on the Non-Proliferation of Nuclear Weapons, U.N. Office for Disarmament Affairs, New York, July 1, 1968, art. I.
 Lippman, "Nuclear Weapons and Saudi Strategy." Ian Jackson, "Nuclear Energy and Proliferation Risks: Myths and Realities in the Persian Gulf," International Affairs, Nov. 2009, p. 1157. Sammy Salama and Gina Cabrera Farraj, "Secretary General of Arab League urges Arab countries to exploit nuclear power, enter 'nuclear club'" WMD Insights, May 2006. The Times, Feb. 10, 2012. Kate Amlin, "Will Saudi Arabia Acquire Nuclear Weapons?" James Martin Center for Non-proliferation Studies, Washington, D.C., Aug. 1, 2008. "The Middle East: Selected Key Issues and Options for the 112th Congress," U.S. Congressional Research Service, Washington, D.C., report R41556, Jan. 3, 2011, p. 6. The New York Times, Dec. 29, 2011. The Economist (London), Sept. 15, 2010.
 Business Monitor International, Sept. 14, 2010. Amlin, "Will Saudi Arabia Acquire Nuclear Weapons?" Yana Feldman, "Saudi Arabia Country Profile: Nuclear Facilities Profiles," Stockholm International Peace Research Institute, July 2004. Rehman, "Saudi Petrochemicals: The End of the Magic Porridge Pot?" p. 36. "Saudi Arabia: Going Nuclear," Country Monitor, Economist Intelligence Unit, London, June 7, 2010. Petroleum Economist, Dec. 14, 2010. The New York Times, Apr. 15, 2007. Related Topics: Saudi Arabia | Spring 2013 MEQ receive the latest by email: subscribe to the free mef mailing list This text may be reposted or forwarded so long as it is presented as an integral whole with complete and accurate information provided about its author, date, place of publication, and original URL.